This movie remained an enigma for me for years. I saw it back in the hey-day, as it played alongside the golden days of Full Moon. In every respect it has Full Moon written all over it, but in the end, isn’t. The main problem was that once you caught a movie on TV, there was little chance it would replay soon after, and it wasn’t always easy to even know the name of what you were watching. I just sat there mystified from the scenes I was witnessing, and almost wrote it off as a bad dream afterwards. The main plot of the movie centers around a not-quote serial killer. See he does end up killing some people, but it’s only through accidents. Instead, he lures people via online chat rooms and then inflicts pain upon them from within his basement. 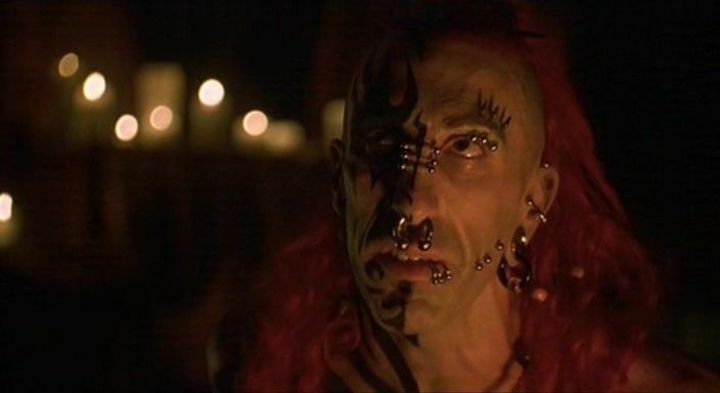 The pain however may seem like traditional torture, but it manifests in the form of either extreme body modification or other ritualistic practices associated with that culture. To some, these would be voluntary acts designed to test the limits of pain and sensation. Now that is also the main plot to the entire Hellraiser series, but it isn’t taken that far. All of the set pieces in Strangeland are taken from fairly common (in context) practices from the body modification subculture. At the least, victims get a new piercing, although if you are male the designation of ‘least’ may be subjective. On the other end, there’s ritualistic scarring as well as kavadi, where numerous sword press against the recipient. At the time, I really had no idea about such things, and most body modification that I was aware of was limited to maybe something as extreme as a tongue piercing, and those were limited to people of middle eastern ethnicity. Course soon after it wasn’t uncommon for American women to pierce a tongue or eyebrow, but those were the ones you could see. Dermal implants, gauging, and the like later became more visible, and didn’t seem as extreme. However with the mighty internet as a window into the things that normally go unseen, there was so much more. So many horrible things. It doesn’t take much to browse the BMEzine site and find out things that will mentally scar you, and those are only the ones that don’t require a paid login. I can really only imagine what lies behind close doors. Or maybe I can’t, and I’m probably better for it. In any case imagine knowing nothing, and seeing this for the first time. You figure they made it all up, but I didn’t really find anything that didn’t exist in some form, and most wasn’t really stretched beyond the truth. Now talking about stretching…remember when The Cell came out. It’s okay if you lie, but we know you sat though it. Suspension via hooks seemed to be one of those things that they HAD to make up. I mean why….why would anyone do that. But no, that’s fairly common too, and there’s names for each pose. That takes place here on a few occasions, both as torture, as well as for fun. Now I do admit, while they did their research into deviant subcultures, they really had no idea what they were talking about when it came to the internet. I didn’t feel that way at first, in fact during the initial scene when the main protagonist shows her friend an online chat room for the first time, it was actually fairly realistic. These were the days of Yahoo chat and IRC, so jumping into a public room usually resulted in a constant wall of text, where your input was quickly lost amongst a dozen conversations. However the internet predator spotted her, and she was invited to a private chat, where there was less noise. He breaks out the AOL speek, and invited the duo over for a party. Now this was about the time, that the Internet was a dark scary place, and you WILL die if you meet anyone there. I’m not denying this doesn’t happen, but most false identity is just some kid pretending to be a super model and usually will at worst simply waste your time. Trolling for pervs was a fun past time while it lasted, and this was well before Chris Hanson. So far, things were a little off, but not too bad. But then they went there…they tried to get technical. Oh man, then it gets ridiculous. You can almost create a list beforehand of the internet tech cliches, then slowly cross them off, perhaps even in order. First, there’s the ability to track the users. Granted, they couldn’t use AOL, or Yahoo, or some other branded product, so they created a fictional application. But the profile seems to almost pinpoint what house they are sending the messages from. The user profiles also update in real time, and you can see them being changed as they type. There’s also the smart girl, who can show the adults how this mystical internet works. Once the adults see this for the first time, they’re fully capable to do their own investigations. At one point, the detective connects his laptop up to his phone, and gets online to stream real time voice. Later on, real time video was used, and at this point, there was no way that was remotely possible. It used to take me the better part of an hour to get a few 30 second music video clips of MTV.com. But every movie is like that, and Hackers didn’t do much to save it. If you want to spot technical impossibilities created from wishful thinking on the part of the writers, give that a try. In the end, it’s a movie that probably wouldn’t age well in a serious manner, but is a blast if you love the campiness of the 90’s. I would still recommend it.